The Unsung Hero of Denver Birding! The Front Range of Colorado offers unique birding experiences from top to bottom. It is actually more strange than anything because each area is vastly different for multiple reasons and the sites I am thinking of are in relatively close proximity to each other. Fort Collins offers the most water in the northern tier of the state, but many of those dang lakes are private. You can imagine riding around willingly putting 150 miles on the SUV while driving around the same county looking for new access to these water holes. So irritating! Boulder has the most birders and therefore the Patagonia Picnic Table Effect comes into play. The more eyes one has equals the more birds one finds. Then there is Denver. Our capital! Venues for birding are on the short list, but where the immediate Denver locale comes short in numbers of sites, we make up for in quality of birding. Southeast Denver and Aurora host Cherry Creek State Park. Often busy with cyclists, runners, dog-walkers and boaters to name a few. The large size helps accommodate most of the urban community. It is not really the most scenic site although the park crew has done a good job of preserving the riparian corridors and marshes on the periphery of the lake. Once having spent enough time in this park a birder will notice that it offers the “kill eight birds with one stone,” feel in terms of hitting multiple habitats. 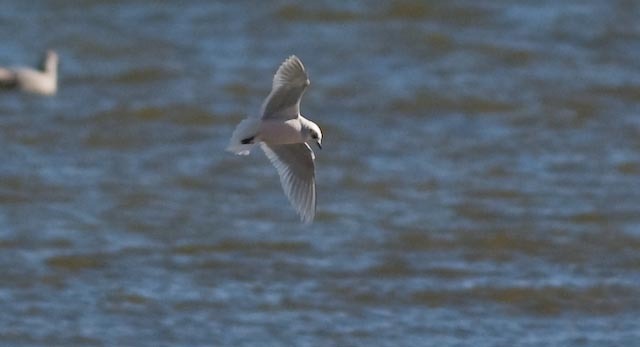 This Ross’s Gull that showed up last winter is but one of many examples of some of the crazy birds that show up here. I joked with my good friend, Jeff Gordon (ABA President), of his luck. He moved from Delaware to Colorado and then like a week later this bird shows up in Denver. Most birders go a lifetime without seeing this species. Consequently, I went twelve years in between my two Ross’s sightings. But it is not just gulls that show up in surprise, but all bird families are represented with rarities in this park. 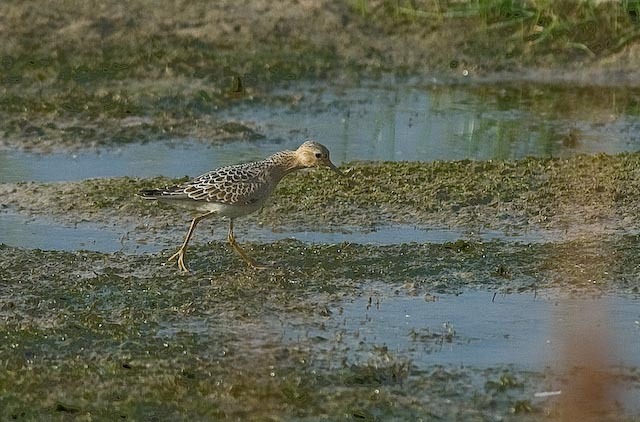 I even chased down a reported Buff-breasted Sandpiper (pictured below) at the lake three years ago. We rarely get those birds on the Front Range. Not too difficult in ID with it’s tan body and elongated nature. The round head and smooth face always tip me off as well when I see these birds in migration. However, usually I recall looking at these birds from hundreds of yards off. It was a treat to have this bird at the Cottonwood Creek access of Cherry Creek and within 100 feet of where I was standing. 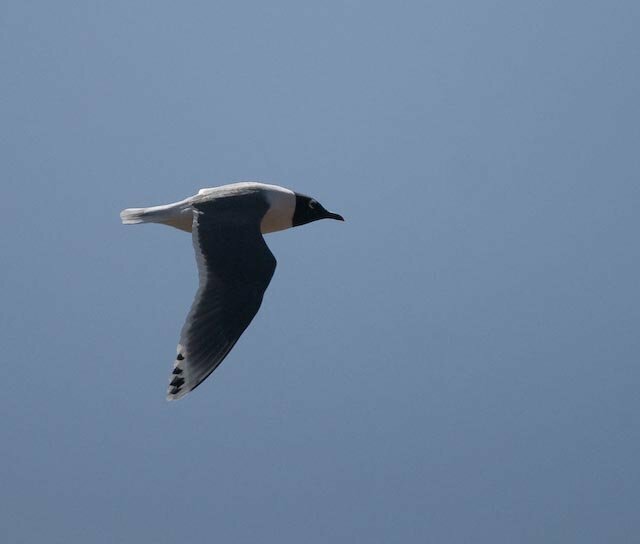 The rounded wingtips of the Franklin’s Gull can be easy to spot as they perform their aerial assaults on insects over the lake water. This is the season where we start seeing these birds in numbers. Harlan’s Hawks often relax in the park for the winter. Usually we have had 2-3 Harlan’s at once in the park entertaining birders on slow winter days. Notice the barring on the vent and undertail coverts? Harlan’s Hawks, like all other Red-tails, are extremely variable so it is so important to know a few key attributes that will help confirm ID. The uniform barring on the remiges and black body with faint white streaking on the breast are all clues. 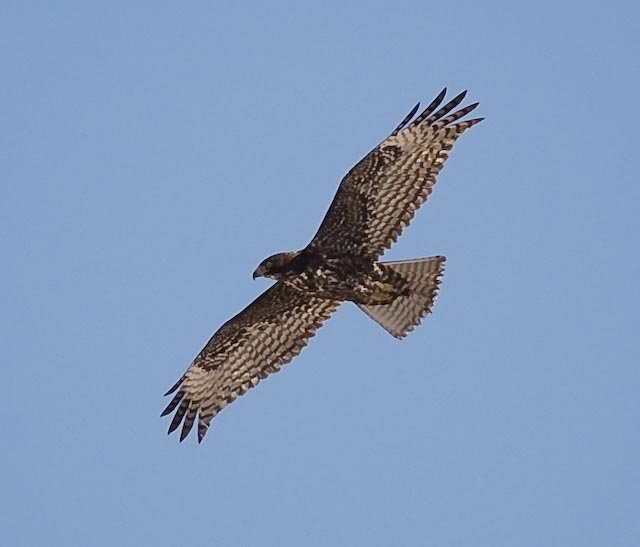 Red-tails including the Harlan’s race are most certainly the birding world’s example of a cross-dresser. They all look and act different and never what we actually expect! I sometimes find myself looking at a hawk for 30 minutes while it’s sitting trying to figure out what kind of Red-tail it is. Furthermore, sometimes I come away with no conclusion and a couple of photos. Oh well! 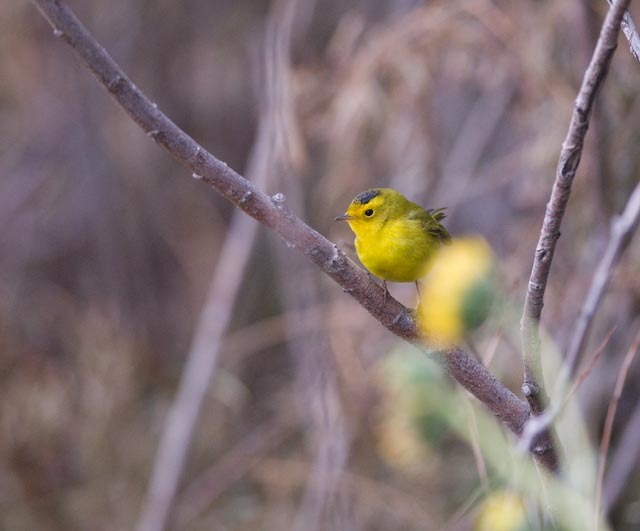 While Wilson’s Warblers are common in fall migration in the many sagebrush, skunkbrush and willow thickets that surround the water…..
…you may have a bird like a Hooded Warbler pop up. Still considered a good sighting, but we are realizing these birds are more regular than we originally thought. So, while Denver gets the reputation of being another big city we can certainly hold our own with cool birds. Undoubtedly, something will show up this fall that will open eyes wide. I’m hoping for a first-year dark-morph Long-tailed Jaeger, but “shhhh,” don’t tell anyone I said that. It might jinx me! Fingers crossed. Whenever the next time is you will be on the Front Range make sure to stop by Cherry Creek for a quick scan of the lake. Who knows? You might find the next rarity. Good birding to everyone and remember, make sure to learn something new with every outing. Cheers! Mike Freiberg grew up in Philadelphia, PA, where his family introduced him to the world of birding. Over time the hobby grew into a career. He attended Iowa State University where he earned his B.S. in Animal Ecology. His summers during college were spent as a biological technician, monitoring breeding birds for Point Reyes Bird Observatory in Eastern Oregon, and also five seasons in Black Hills, SD, working for the Rocky Mountain Bird Observatory. As his passion for birding grew he decided to travel Latin America; he has spent time in Mexico, Guatemala, Venezuela and a great deal of time in Brazil. One of his most memorable birding experiences was the six months spent in Northeast Brazil performing research on a new species of bird called the Araripe Manakin. Mike is currently the Birding Market Specialist for Nikon Sport Optics and provides outstanding content for the Nikon Birding Blog. Nice post! I was at Cherry Creek State Park for a few days earlier this month. I always enjoy a trek through the wetlands area and rarely come away without interesting shots. The mosquitoes just about carried me away this year though!!! 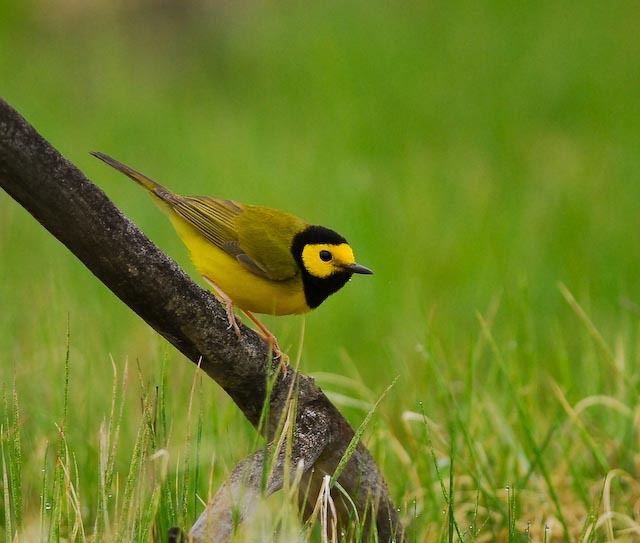 Great shot of the Hooded Warbler! Sounds like a great hotspot. Good luck with the young jaeger!